After the downhill decline of the Tony Hawk series culminating with the disastrous Ride and Shred games, Activision put it on the back burner for awhile. Originally developed by Neversoft, the games had moved on to developer Robomodo after 2007’s release of Proving Ground. 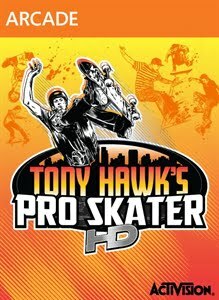 Giving Robomodo another chance, Activision has released the much anticipated Tony Hawk’s Pro Skater HD to downloadable services on the major consoles. Built from the ground up to emulate the gameplay and physics of Tony Hawk’s Pro Skater 2, Tony Hawk’s Pro Skater HD is more like a greatest hits album of the first two games rather than a HD re-release. When Tony Hawk Pro Skater and later the THPS 2 came out, they revolutionized extreme sports games. Buttery smooth controls allowed players to combine tricks and outscored their friends with combos. Neversoft had the right balance of physics and controls to make a game that was hard to put down. Unfortunately, the decision to rebuild the game from ground up leaves something feeling off in HD. The skater tends to bail…a lot. If you were to load up the first re-release of these two games, Tony Hawk Pro Skater 2X, there is a noticeable difference. HD throws you into the core of the game with no clear objectives. Pick a character, choose the first stage Warehouse, and you have two minutes to skate. To unlock a new level, you have to complete objectives that range from collecting the letters that spell skate to scoring high scores. All of the objectives from the original games’ levels make it in. Earn money from objectives and you can buy items from the shop or skill points for your character that affect how well you skate. There is a good variety of real life skaters that you can play as plus your Xbox LIVE avatar gets in on the action. The avatar looks a bit silly due to proportions but it is easy to get used to it. To keep the replay value up, progress made on one skater does not transfer over to any other skaters. So if you unlock levels on Tony Hawk, they are still locked on your avatar. Speaking of levels, this is where HD truly disappoints. It only includes 7 levels from THPS 1 and 2. Classics like Warehouse, Hanger, and School II make the cut and strangely enough so do the less liked Venice Beach and Marseilles. It really doesn’t make sense why the rest aren’t in the game unless it was a time issue or possibly plans of DLC. Revert and levels from THPS 3 have already been announced, so DLC from the first two games is likely. Like the levels, the music selection for HD only has about half the tracks from the original games. This is more understandable because music rights are a grueling experience. Ask any tv show trying to release a DVD collection that featured music. But the lack of levels mixed with the music really does leave HD with that greatest hits album feeling rather than HD remake. So is the game just harder or did Robomodo screw up the balance? In the end it doesn’t really matter because it leaves the game less fun. Add in the sparse pulling from both titles and the plans to sell pieces of the other games as DLC and it really starts to feel the ball was dropped with Tony Hawk Pro Skater HD. Despite all the issues, the game is fun but is way below expectations. It was a much anticipated game from fans disappointed with the last couple games and it looks like they will have to join Sonic The Hedgehog fans in their constant disappointment.